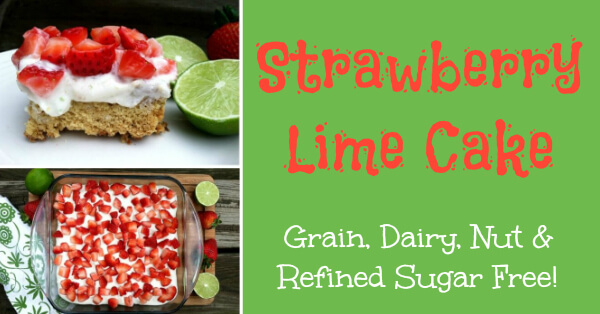 Just like my belly and bacon make me happy, so does this strawberry lime cake. It’s refreshing and summer and you’re just going to love it! The best part is that it’s completely grain free, dairy free, nut free and refined sugar free, but I promise you that you would never know it. Annnnnd , it’s also been kid tested and approved by my picky kid taste testers! High fives all around 🙂 Enjoy! Strawberry Lime Cake. Grain Free, Dairy Free, Nut Free, Refined Sugar Free, Gluten Free, Paleo Friendly. In a mixing bowl, combine the eggs, lime juice/zest, coconut oil, honey, milk and vanilla. Mix well then add in the coconut flour, baking soda and salt. Mix until combined. Pour the batter into a greased 8x8 baking dish and bake for 20-25 minutes or until done in the center and golden on top. Let cool. Once cooled, frost your cake with the whipped "cream." Place in the refrigerator for at least 1 hour. Top with the diced strawberries and enjoy! Keep any leftovers in the fridge. Refrigerate your can of coconut milk overnight for best whipped results. Use jus the coconut cream that has risen to the top of your can of coconut milk. You can use the leftover liquid for smoothies or save it for another use. Place jus the coconut cream in a bowl or stand mixer. Whip until peaks form. Once it's whipped, add in your lime zest, honey, vanilla and sea salt. Whip once more until it's thoroughly mixed. Great Recipie. Can we substitute Lime with Lemon? Thanks. What a perfect Summer dessert! Can’t wait to try this!! So, I’ve been trying to go gluten free recently. I made this dessert for Mother’s Day dinner last night and it was a HUGE success. I didn’t tell anyone about the ingredients and they all loved it! Thanks for posting. I have a can of coconut cream. If I use that, how much should I use for the frosting? Katie, I’m thinking I get about a cup of coconut cream out of coconut milk can. YUM, this looks amazing! Thanks, Kelly! I made this over the weekend for Mothers Day and it was soooooo Yummy!!! Thank you! Woo!! So happy to hear!! Great recipe! All 4 of my kids devoured it and asked me to make it again for tomorrow! I think I will because they didn’t leave any for my husband to try! So happy you all liked it!! This one I’ll be making again and again! The kiddos loved it! I made this using lemon instead of lime and it was absolutely fantastic! A great summery cake. Thanks for the recipe!! 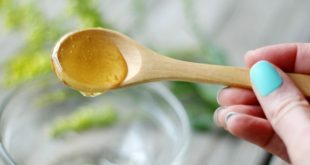 can’t do honey, I’m T2 diabetic on low-carb high-fat diet. What can be substituted for it? Hope you get to try this out! I made this for Memorial Day. It was good. Next time I think I’m going to try it with lemon and raspberries. For the butter and coconut oil, I measure them before malted or after? how long does the cream stay whipped? From what I’ve seen, as long as you need it to. I’ve never had a problem with it getting “un-whipped.” I usually keep this dessert in the fridge until ready to serve, but I’ve also left it out for a whole day on my counter (oops) and it stayed whipped and was delicious 🙂 Hope that helps! My friend made this for our dinner party on Friday night! It is sooooo yummy! I ate two pieces!! And, since she’s so nice, she left me the rest and I ate it for breakfast!! Too good! The cake part was moist and perfectly baked, and the cream and strawberries were so delightful!! Made this for a GF’s birthday & it was such a HIT…absolutely Delish!! I found this recipe last week and it looked so good. I decided to make it for our Labor Day family BBQ. I am a bit OCD and made a “practice” taste tester for my 4 kids and hubby today. I am in heaven! It is pure awesomeness. Thank you for sharing this recipe. Looking forward to trying more of them. Woohoo! This makes me so happy to hear!! i just made this for easter dessert. it was so amazing. only my husband and myself and my 2 nephews are paleo but everyone raved about it and requested the recipe. i will certainly be making this again!!! This makes me so happy to hear!! Thanks for the comment, Jennifer! What is the calorie/fat/carb count? Have you ever successfully doubled the recipe? Also, do you think the same ingredients will work with dairy whipping cream? I have, Stephanie! It works great doubled. Yes, the ingredients will be so good with regular dairy whipping cream! Does the coconut flour give a coconut taste? Is substituting it with almond flour an option? Hi Fray! No, for this recipe it doesn’t give a coconut taste at all. Almond flour can’t be substituted with coconut flour because coconut flour soaks up so much liquid, much more than any other flour. Your recipe sounds divine! Once I have frosted the cake, how long can I keep it refrigerated before the frosting begins to lose quality? Hi Sue! I’ve made this so many times over the years and have had leftovers in my fridge for a week and it’s still great, including the frosting.